Beautiful "Khambadiya" floor pillow made by hand by artisans in Barmer, India from carefully chosen and sown together patches from vintage saris, lenghas and wedding dresses. ndian ottomans and floor pillows look great in any setting, and are a great and affordable way to add some comfortable seating for your guests! 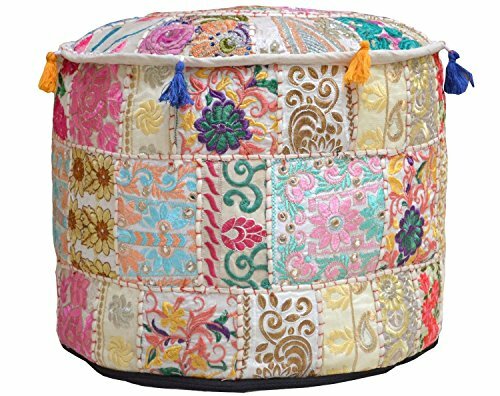 PLEASE NOTE THAT IT IS A COVER ONLY AND THE INSERT IS NOT INCLUDED SINCE THE POUF COVER IS MADE FROM VINTAGE FABRIC PATCHES, EACH POUF COVER IS UNIQUE. THERE WILL BE VARIATION IN THE PATCHES HOWEVER THE BASE COLOR OF THE POUF COVER WILL REMAIN SAME. THE UNIQUENESS OF THE PATCHES IS THE SPECIALTY OF THE PRODUCT AS NO TWO POUF COVERS ARE ALIKE. There will be VARIATION in the patches however the BASE COLOR of the pouf cover will REMAIN SAME. If you have any questions about this product by Aakriti Gallery, contact us by completing and submitting the form below. If you are looking for a specif part number, please include it with your message.